Facebook may be building a secret HTML 5-based site for the iPad and other advanced devices, but the company hasn't forgotten that the majority of Americans still own a feature phone. Facebook announced late Tuesday a new downloadable app called Facebook for Every Phone that brings a smartphone-like experience to lesser handsets. The new app works with more than 2,500 Java-enabled feature phones, and includes the usual Facebook trappings such as the News Feed, message inbox and photo viewing. 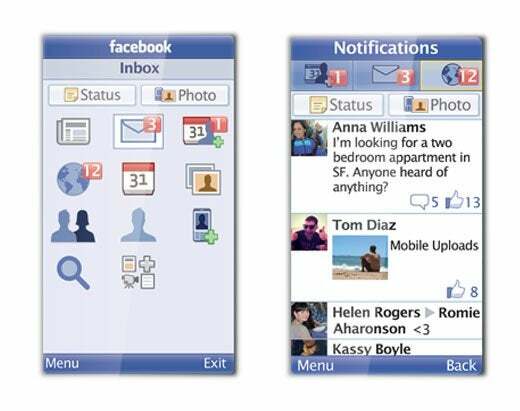 Facebook for Every Phone also includes the ability to upload photos to the social network and discover new Facebook friends from your phone's contacts. The company says the new app has been designed to use less data than other Java apps or mobile sites. To entice people to use Facebook for Every Phone, the company has partnered with several cell carriers worldwide to offer free data usage for the new app for the next 90 days. The bad news is, Facebook hasn't partnered with any U.S. carriers for this offer. The free data plan appears to be largely a play for international users in places such as India, Russia, Indonesia and the Philippines. Feature phones reign in U.S. Although smartphones are becoming increasingly popular in the United States, feature phones are still more widely used. About 38 percent of U.S. mobile handsets are smartphones such as the iPhone, Android and Blackberry devices, according to a recent Nielsen survey. That means 62 percent of Americans are still opting for less expensive flip and candy bar phones to stay connected while on the go. That may soon change, however, as Nielsen says 55 percent of new cellphone purchases between March and May of this year were of the smartphone variety. If you're part of the declining feature phone majority you can grab the new app at d.facebook.com/install or from app stores such as GetJar, Appia and Mobile Weaver.